Ultimately, the iPad is a large iPod touch: a great device to draw your inspiration from, but perhaps not the seismic shift in technology that we were expecting. The much anticipated announcement of Apple’s iPad tablet was met with a resounding…”ho hum” or worse from much of the technology crowd. The biggest criticisms were its lack of key features (no Adobe Flash, lack of USB ports, where’s the camera?, etc.). Apple iPad as a technology innovation disappointment. But with Apple, and Steve Jobs, that’s not really the point now, is it? Sure, Apple has had plenty of technological innovations along the way. But then, so has its competitors. Yes, Steve Jobs is a showman, but that effect only lasts for MacWorld presentations. No, what Apple does well is put forth “radical innovations of meaning”. That term is from Roberto Verganti, who wrote about the concept in his excellent book Design-Driven Innovation. Apple’s skills with design-driven innovation are what will make the iPad a success. Verganti’s books builds the case for a different form of innovation. One in which companies tap the undercurrents of societal changes early, and create products addressing them. As Artemide chairman Gismondi puts it, these products are so different, they are akin to “making a proposal” to a market. They are not linear updates to existing products. 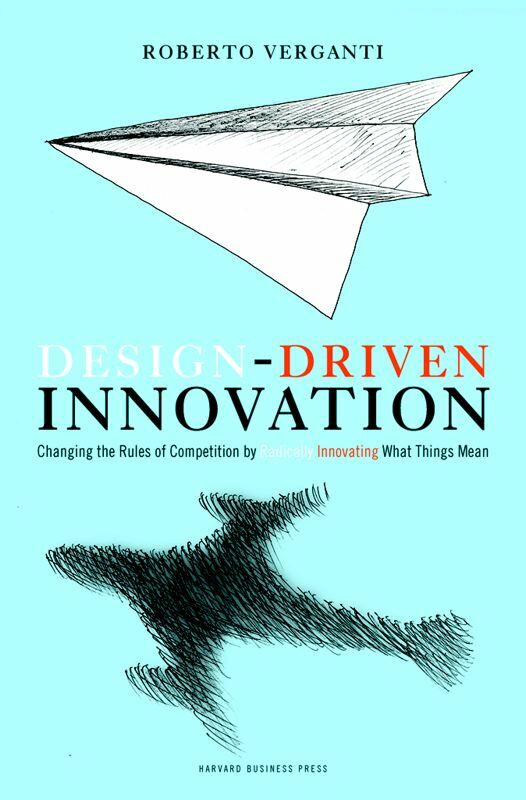 As Julian Bleeker notes in his review of the book, design-driven innovation is not a “follow the trends” approach. “Trends” are what any company can do. Rather, it’s deciding that conditions are right to introduce a product that plumbs changes previously unexplored in your industry. Verganti describes this work as the radical innovation of meaning. Many purchases are based as much on meaning as they are on features. Innovation of features is an ongoing process for companies. But innovation of meaning is a stunted process for many firms. While it may sound trivial as you read this, this product line was an absolute gangbuster in sales. Alessi figured out that people still enjoyed playful experiences, even as adults. No one else was thinking this way in the industry at the time. But now the kitchenware actively pursues emotional design. It was no accident either. Alessi spent time researching changes in societal norms. That we still like to be kids was a change they saw (and one that many of us today take for granted). Companies that do this well are both influencers and participants in what Verganti describes as the “design discourse”. This is an ongoing conversation with thinkers, tinkerers, researchers and companies who target the same evolving changes in societal context. Often, these are people outside your industry who are studying the same changes you are interested in. It is by accessing these networks where companies can “see” evolutions of societal norms that offer opportunity. These are opportunities not driven by expressed consumer desires, but by shifts in cultural norms. Done well, companies that successfully innovate the meaning of products enjoy significant growth and profits. Oh, and early on, these innovations of meaning can be slow to gain acceptance by the market. Explains the early iPod and Nintendo Wii reactions. Apple iPad: What Is Its Radical Innovation of Meaning? iPad is tapping into an emerging dynamic of a more interactive, tactile experience with digital technology and information. These interactions make technology less of an interface, and more of an extension of ourselves and our environment. The tweets above are a couple that show the natural way children engage with technology. Given the iPhone experience, they turn around and want to apply it to other devices. Buttons on devices, our traditional form of interaction, are divorced from the screen. They provide a measure of distance from the digital experience. Touch, however, represents a new level of intimacy in the digital experience. In technology terms, it’s just an alternative form of interface. Touch, mouse, tab, whatever. But touch is a vital human sense, and a core part of experience. It’s how we interact with others, how we shop, experience textures and so much more. In terms of the “design discourse”, there are pointers of changes ahead in terms of integrating touch more deeply into our digital engagement. The Wii and iPhone, and before the iPod click wheel, have created a popular introduction to gesture based interfaces, demonstrating responsive feedback behaviours, applying “natural” physical effects like flipping and inertia, similar to the ones we are accustomed to in the real world, to improve usability expectations of an interface. As new “cultures of use” emerge we are creating opportunities to form a language of gestures, similar to the conventions of “right-clicking” and standardised keyboard shortcuts. Note the term “culture of use”. Not industry trends. Because the dominant form of interaction for computers and video games is still mouse and buttons. And consumers aren’t asking for touch. But there is an underlying change in thinking about how people interact with technology and information. 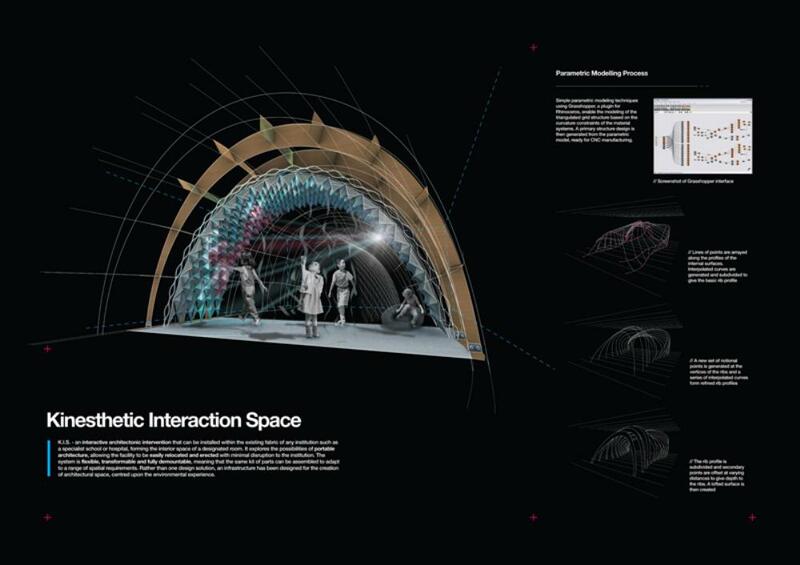 University of Nottingham Nottingham UK student Stephen Townsend received a commendation in the recent President’s Medal competition in the U.K. His entry, Digital Intimacy, depicts a concept where interaction is built into the architecture. If you notice the graphic to the right, you will see people reaching out their hands and interacting through touch. Townsend calls it the “kinesthetic interaction space”. Kinesthetic refers to a style of learning based on physical activities. The ‘Kinesthetic Interaction Space’ is conceived as an interactive architectonic intervention aimed at children with autism, providing sensory stimulation to assist with intervention methods and aid interaction with other children through shared kinesthetic experience. The focus of the thesis is on the development of dynamic material systems that could enable new forms of interactive environment. Architecture is conceptualised as an embodied interface and physical space has been fused with digital media in order to stimulate the imagination of inhabitants. K.I.S. is intended to facilitate playful explorations and fluid dialogues between people. The user learns to interact with their environment through an intuitive process, engaging the physical presence of inhabitants and forming spatial narratives. While Townsend’s concept addresses children with autism, the underlying design is consistent with greater digital intimacy overall. PhD student Fabian Hemmert presented at a recent TEDx talk. He is working on a concept where phones include physical movements that better connote actions to people using them. In the video below, you’ll see him describe how the phone would shift weight in relation to changes in movement on a map. As Hemmert notes, humans live in a physical world, one “which tastes good, feels good smells good”. He wants to design products that better integrate that experience. Those three examples I just gave are part of a larger design discourse about the nature of digital engagement in our future. Are we “locked in” to the mouse and keyboard? Or will we continue to evolve the interaction experience? If you think about how a computer like this will impact people sociologically, suddenly the iPad is far more than a larger iPod Touch, as many have described it. It’s the computer for everyone: an idea Apple has been working toward for years. That doesn’t mean the iPad will be the only computer for everyone and destroy every PC on the market, because that’s not even remotely likely. But it will introduce a significant new category. Bold pronouncement for sure. But entirely consistent with a radical innovation of meaning. Henry Blodget sees an outcome of this drive for digital intimacy: pervasiveness. They won’t live on desks, the way desktops do, and they won’t be carried everywhere, the way mobile phones are. They’ll just be there, around the house, on tables and counters, the way today’s books, magazines, games, and newspapers are, booted up, ready to use. Keep in mind student Stephen Townsend’s kinesthetic interaction space, built into the house. How about an iPad in every room of the house, ready to go? You can see thinking evolving on similar lines here. I can see people becoming quite attached to their iPads. Their little units of digital intimacy. Once you see where this is going, it should come as no surprise that Apple may be working on a larger version of its iPad, as a full computer. Steve Jobs is placing his chips on this radical innovation of meaning.